What is a Registered Officer (RO)? Applicable only for Singapore registered entity with Unique Entity Number (UEN), the RO is the person whose name is officially registered with ACRA or any of the other UEN-issuance agencies. Examples of RO(s) include: Owner, Partner, Director, Corporate Secretary. Typically, the RO should be the person nominating and approving new CorpPass Administrators. In the event the RO is unavailable, click here. What is a CorpPass Enquiry User? The Enquiry User is an account created by the entity’s CorpPass Administrator or CorpPass Sub-Administrator. The Enquiry User account may be used to transact with Government digital services, and to view details of the entity’s CorpPass setup. For example, the Enquiry User may view the entity’s list of digital services, the details of CorpPass accounts under the entity, and the transaction history of these accounts. What is a CorpPass User? A person who is assigned by the CorpPass Administrator (Admin) to transact with Government agencies on behalf of the entity. Examples of who may fulfil this CorpPass role include: Corporate Services Personnel (e.g. Payroll Executive, Human Resources Manager). Each User will have a unique CorpPass ID. There is currently no restriction on the number of Users that each entity may have. 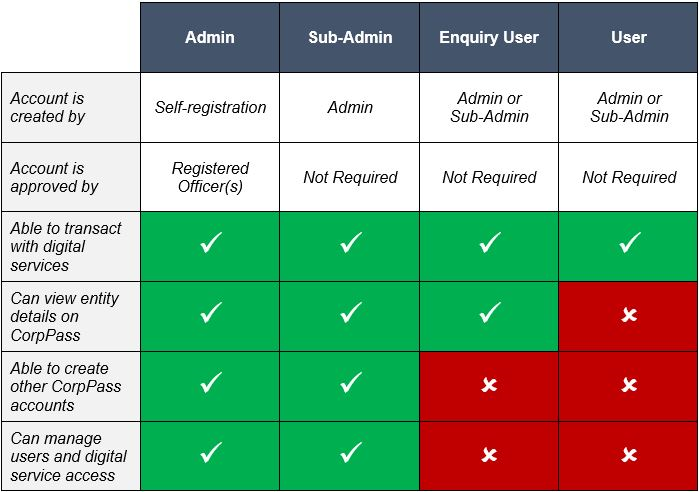 For smaller organisations, the Admin may assume the role of a User. I need a CorpPass Account. What should I do? If you have been appointed as the CorpPass Administrator (Admin) for your entity, you may proceed to register for an account. Otherwise, please approach your entity’s Admin or CorpPass Sub-Administrator (Sub-Admin) to have an account created for you. How do I find out who are the CorpPass Administrator (Admin) or CorpPass Sub-Administrator (Sub-Admin) in my entity? We will request for your entity’s CorpPass Admin to contact you. Is there any fee to obtain a CorpPass account? There is no fee to register for a CorpPass account. How do I transact on behalf of multiple entities? Do I need multiple CorpPass accounts? Have a CorpPass Account (i.e. CorpPass Sub-Administrator, CorpPass Enquiry User, CorpPass User) created for you. Can I still use my SingPass to access Government-to-Business (G2B) digital services and transact on behalf of my entity? You can continue to use your SingPass to perform Government-to-Business (G2B) transactions on behalf of your entity until 31 Aug 2018. CorpPass will be required for all entities with a Unique Entity Number (UEN) to transact with the government from 1 Sep 2018. Entities are encouraged to register for CorpPass as soon as possible to avoid disruption to your business flow. When will all Government-to-Business (G2B) digital services adopt CorpPass? CorpPass is already available for over 160 government digital services managed by more than 50 agencies. More digital services will progressively onboard CorpPass. Will I know when a new digital service onboards CorpPass? When you login to CorpPass, a notification on your account landing page will indicate if there are new digital services that have onboarded CorpPass. You may also download the list of digital services that are currently available on CorpPass here. What are the supported browsers for CorpPass?